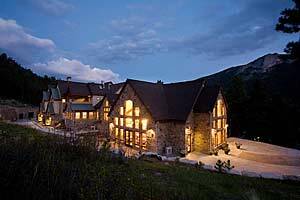 We list all of the Estes Park area Bed & Breakfast Inns that directly serve Rocky Mountain National Park. If you know of any B&B that we do not have listed, please contact us. A Quiet Riverside Retreat, Dripping Springs has lodging for couples in the adult only B&B, with hot tub and steam sauna, and massage house. There are cozy cabins for two, or for families in the Cabin side of the resort. Cabins and Vacation Homes all have private hot tubs, sat. TV, fire pits, and most have fireplaces. Just 10 minutes from the RMNP and 3 minutes from downtown Estes Park, enjoy peaceful canyon scenery. Great fishing, romance and adventure packages in summer. Whimsical decor and comfy beds will make you smile! The Sonnenhoff B&B is European style Bed and Breakfast located just 7 minutes from Estes Park and 10 minutes from the Rocky Mountain National Park. Fantastic panoramic view of the mountain ranges and Mary's Lake. The Golden Aspen Suite with it's rustic but romantic setting, bathes you in luxurious comfort. The European Charm of the Alpine Flower Suite proudly features furnishings from a master craftsman. The Romantic Rose Suite is a feast for the eyes. It offers one of a kind Oak furnishings that were all handcrafted by the owner. Let Sunshine Mountain Lodge and Cabins be your place to getaway and relax, recharge and refuel. Our main lodge, 6 cabins and 5 wooded acres provide an ideal setting for personal getaways, group retreats, family reunions and other special events. Located just south of Allenspark on the scenic Peak-to-Peak Hwy., we're minutes from Rocky Mountain National Park, the Long's Peak trailhead and the Indian Peaks Wilderness, offering unlimited trail exploration. Relax and enjoy the peace and quiet, a soak in our outdoor hot tub, a therapeutic massage ... August thru October, enjoy our complimentary breakfast, guaranteed to fuel you for the day. Our spacious cabins sleep up to 6 and include living rooms, fireplaces (in some units), fully equipped kitchens and modern baths. Open and easily accessible year-round, we feature affordable rates, rustic charm, homey comfort and lots of personal service. The Allens Park Lodge is a classic mountain B&B, nestled in a very small, quiet, flower starred village, offers time & place to create memories for a lifetime. Comfortable rooms, warm hospitality, magnificent great room, video/rec room, hot tub. Hot family-style breakfast. Wine & local micro brew beer served. Espresso coffee shop. Spacious sun room for meetings, receptions, weddings. Special seminar package available. Modem OK. Near Rocky Mountain National Park. Let the memories begin. Classic mountain B&B, nestled in a very small, quiet village. Your Place in the Mountains … main lodge, 6 cabins and 5 wooded acres.